To get into Laos we drop back into Thailand from Myanmar and then across the boarder where we take an amazing two-day slow boat down the Mekong river (below) into the heart of the country. We’ve been on some impressive forms of travel on this project so far, but the views either side of the river, with elephants coming down to bathe in the morning, was something to behold. It was definitely a slow boat - but we settled in for the scenic ride with the mix of locals and travellers. Once arriving in Luang Probang we take a day trip to Kuang Si waterfalls and natural pools to take some time off. Of course we took the Zsig 21inch racquet with us (below). It doesn't show, but there was a lot of spray coming off this waterfall. We got pretty wet for the photo. Obviously worth it. Through the email list given to us by the International Tennis Federation we manage to gain contact with the Tennis Association in Vietnam, so Ellie and myself move through Laos, using rest stops as we take in the rugged nature around, taking bikes, motorbikes, quad-bikes and most other modes of transport to explore and make our way across the counrty. 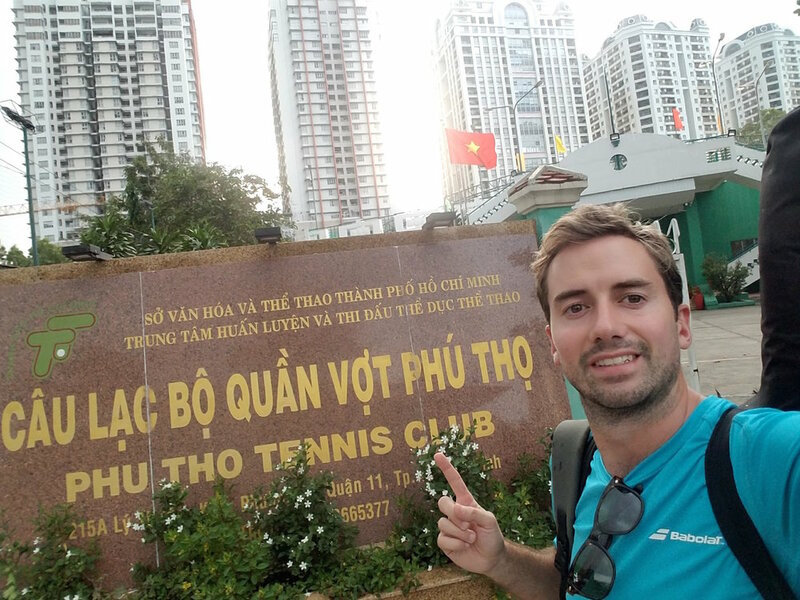 Moving across the boarder into the north of Vietnam we gain further contact from a Ms Mary Thuy from the Vietnam Tennis Federation in Ho Chi Minh City to discuss the project more. We’re currently in the north of the country, and Ho Chi Minh located in the south, it's time for a road trip! Already excited about the local cuisine we spend a couple of days in Hanoi, sampling the food through a highly rated street tour and with some of our own exploring. 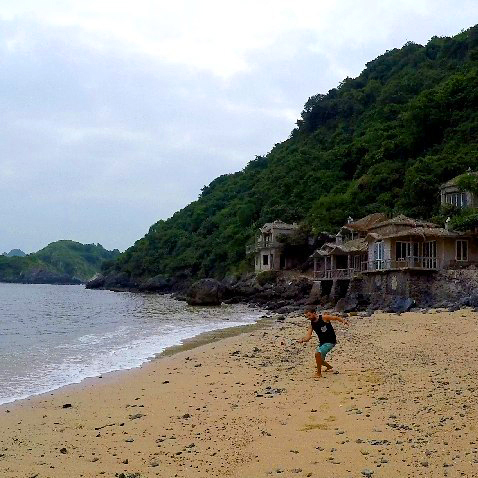 Whilst in the top of the country we want to make sure we get over to the famous islands of Ha Long Bay. So we book a boat to take us round the islands. Whilst spending a night on one of the beaches, we get out the Zsig racquet to hit a few forehands (below). We're definitely looking forward to getting this kit into the hands of a child and get back to teaching on-court. 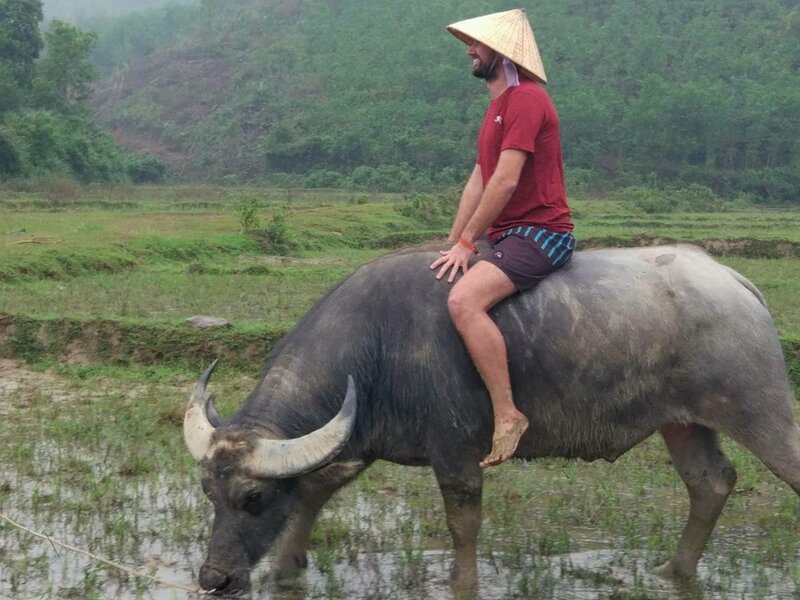 Once back on the mainland we jump on a bus transfer down to Phong Nha where we stay in an amazingly fun hostel called Easy Tiger who arrange a visit to Phong Nha Cave in the morning. It was this hidden cave that, the Vietnamese stored it’s military and medical supplies during the Vietnam war – only moving the contents during the cover of dark via boat up the river. We were restricted to the areas of the cave we could explore, but of what we could, it was was full of colour from the different types of rock sediment. There was a lot of destruction once the Americans found the entrance to the cave, so a lot of the natural rock formations (stalagmites and stalactites) had been destroyed but it would have been a pretty incredible hideout at the time, although not under the circumstances. A lot of the cave was artificially lit for the tourists. We felt it the right time to get on 'stage' for a bit of cave tennis (below). Not many places we haven't taken the Zsig tennis kit now. Further down Vietnam we hear of the extreme flooding that is currently hitting the country around Hue. When we arrive, the water levels have luckily dropped to normal levels. The Freedom Hostel owner, where we checked in on arrival, described to us how only two days earlier the guests were trapped due to the street flooding. They apparently all kept themselves entertained by having swimming races up and down the street - extreme, but sounds fun. One thing we’ve always wanted to do is motorbike down the picturesque, and often dangerous, Hoi Van Pass (between Hue and Hoi An), made famous on the BBC programme, Top Gear in 2008. With the guitar case of tennis kit and rental motorbike (below - p.s. this was also the street that was flooded! ), we make our way on the windy mountain roads. The scenic route made for many great photo’s. Naturally we stick me serving in the middle of the view. 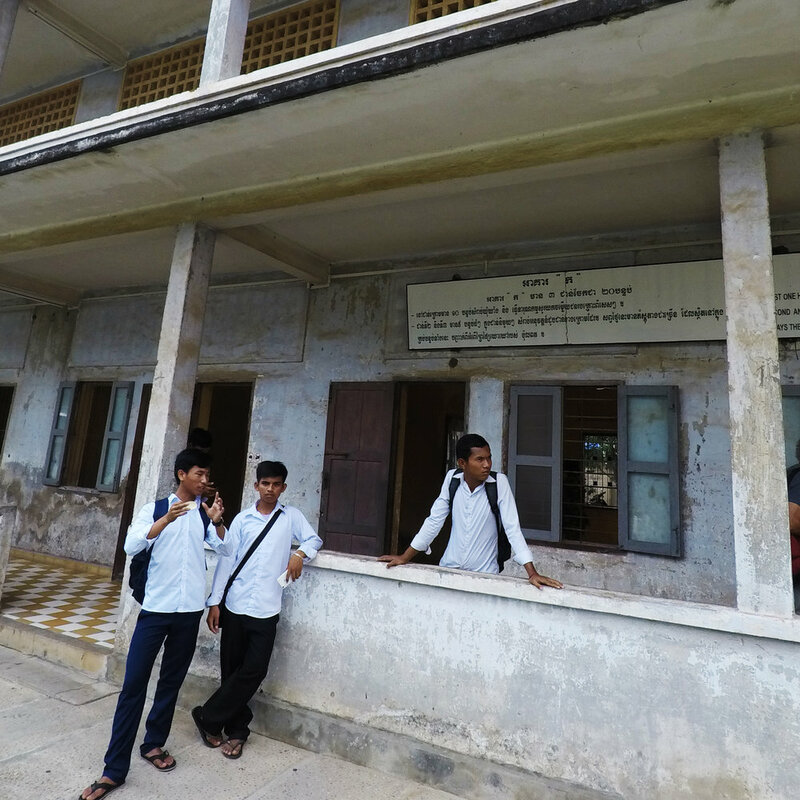 Flying into Phnom Penh, nothing could have prepared me for the horror of the high school torture museum ‘S-21’ - one of 196 prisons operated by the Khmer Rough regime. Of the 14,000 people known to have entered the building, only 7 survived. 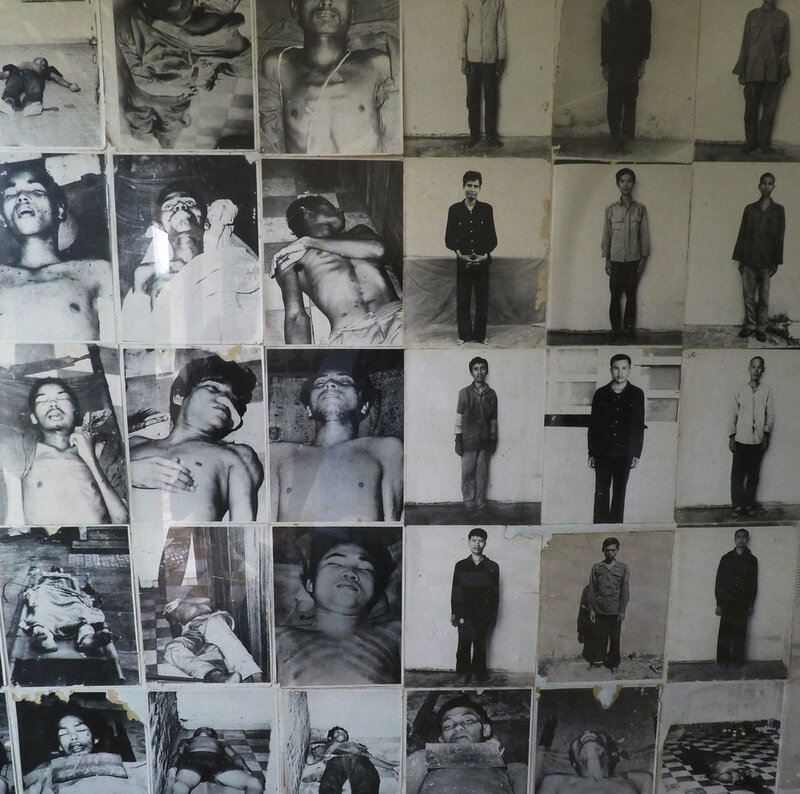 The total genocide in Cambodia was between 1.5 and 3 million people led by Pol Pot - that was almost 30% of the total population. The audio tour was intense. It’s amazing how, rather than destroying the building (like they did many other sites) they have put together such a harrowing museum - acting as a reminder to the rest of the world not to make the same mistakes again. The forgiveness and kind-heartedness the Cambodians show is remarkable. Truly humbling. After already visiting so many schools on this journey, it was a leveller to see all of the local school trips to the museum. Children reminded what happened here not so long ago (only between 1975-79) - with many of the children having relatives that would have died in these facilities. It is a stark reminder of what is important in the world. 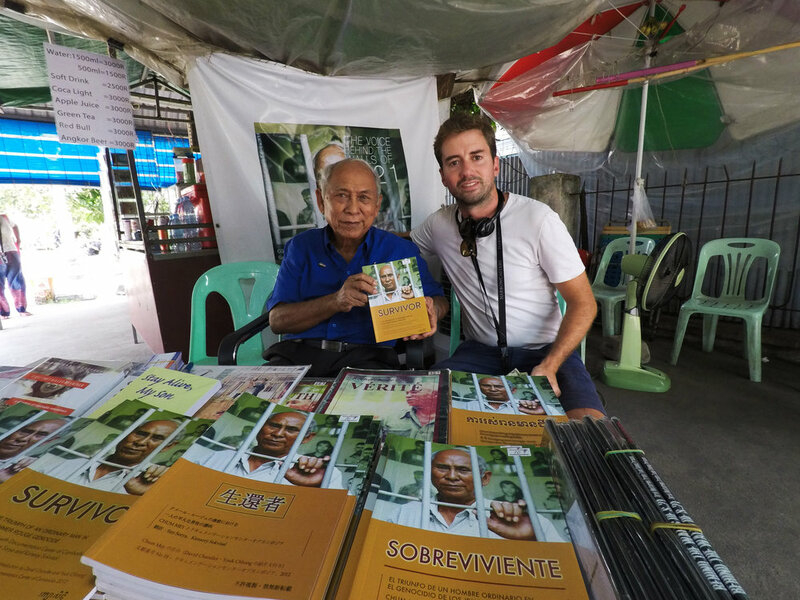 I was particularly humbled to meet one of the only living survivors of S21, Chum Mey, and although I did not have the space in my bags to be able to buy one of his books, I donated money to the cause. This is a book I shall be sure to read in the future. I can’t imagine what this man must have gone through and seen. He only escaped the torture and execution as the guards found out he was an engineer and could fix their typewriter. He went on to be their odd-job-man and made it through the years at the prison. Having to move on, and feeling pretty lucky to be able to leave the city a free man, I make my way up the country to Siem Reap via coach. Here in the hostel I watched ‘First They Killed My Father’ - a must watch if you are interested in what life must have been like for families during this period. Getting an early morning tuk-tuk we make it to the famous site of Angkor Wat temple complex. The largest in the world at 162.6 hectares, built around 113-5BC. Originally built as a hindu temple and slowly transformed into buddhist. Exploring these grounds was like another world. And we found plenty of times to get the mini racquet out. 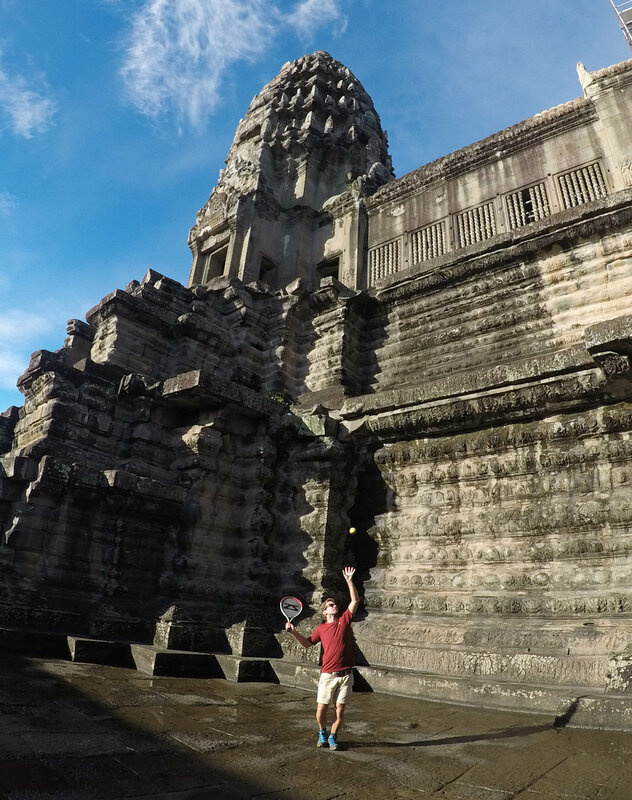 My trip through Laos, Vietnam and Cambodia has made me realise how lucky we are to even have the privilege of being able to deliver sport to children. Particularly when there have been so many recently war torn countries when survival has been the most important things in people’s lives, let alone time for sport. Tennis won’t change the people they have lost, but we’ve realised that it is a vessel of fun and social cohesion amongst the children and adults within their communities. A great thing that sport can give. With the amount of orphanage tourism and exploitation on the rise in these countries we felt it more suitable to organise extra tennis kits to go to the National Associations linked with the ITF to make sure these go the correct ambassadors and local coaches to ensure it has the most impact in the countries.